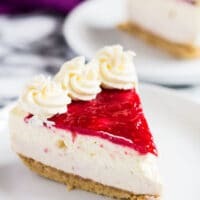 No-Bake White Chocolate Raspberry Cheesecake – Scrumptiously creamy no-bake white chocolate cheesecake infused and topped with fresh raspberry sauce and whipped cream! Seeing as it’s still warm outside, I’m bringing you all another no-bake dessert so you don’t have to turn on your ovens. And because I can’t take the heat! So! 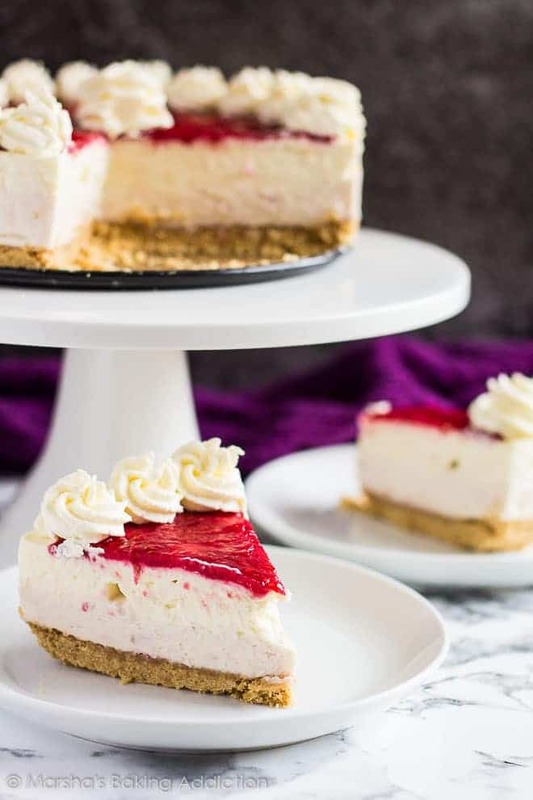 White chocolate lovers, raspberry lovers, cheesecake lovers, I bring you my No-Bake White Chocolate Raspberry Cheesecake. 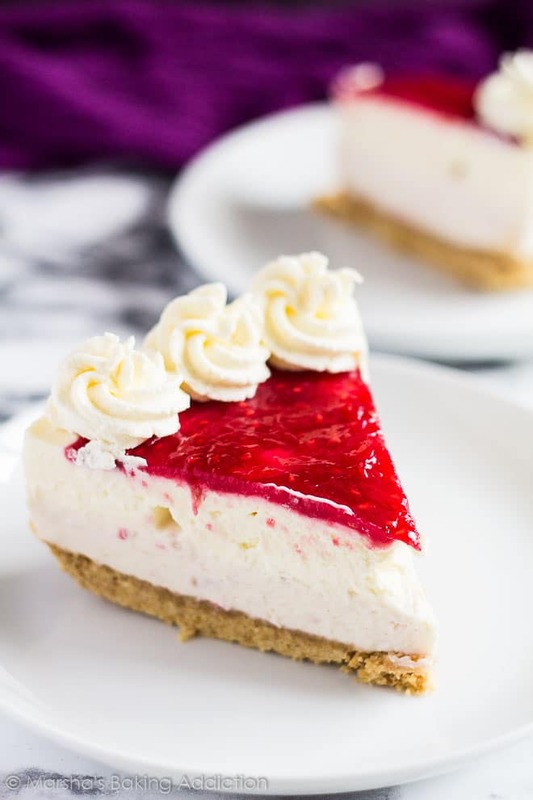 I absolutely love white chocolate, so I had to add it to my raspberry cheesecake because I think the flavours pair beautifully. White chocolate and raspberry heaven right here! 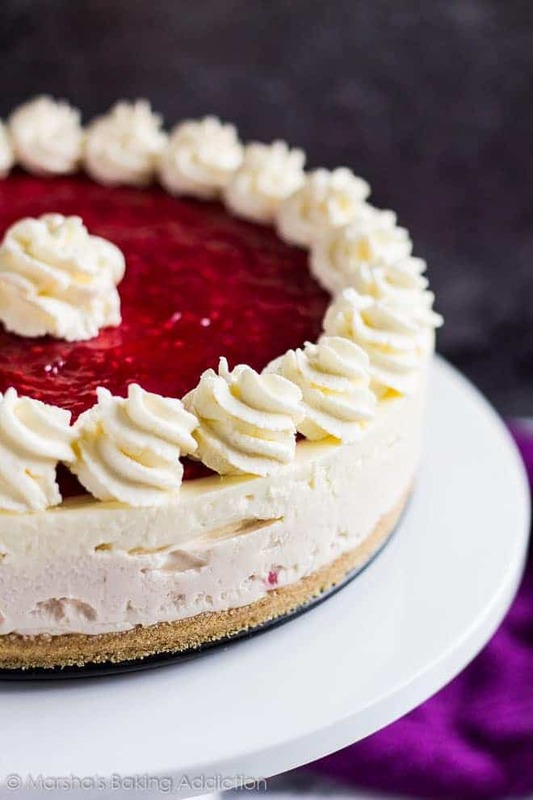 To make this cheesecake, let’s start by making the raspberry sauce. Blend the raspberries and water in a blender or food processor until smooth. In a saucepan over medium heat, add the sugar and cornflour. Add the raspberry puree and stir constantly until the mixture thickens and comes to a boil. Allow to boil for 1 minute, then remove from the heat. Allow the sauce to cool completely before use. For the crust, stir together the biscuit crumbs and sugar. Add the melted butter and mix until all of the crumbs are moist. Press the mixture into a greased 9″ springform pan and chill whilst preparing the cheesecake. For the cheesecake, whip the heavy cream until it starts to thicken. Add the icing sugar and vanilla and whip to stiff peaks. In a separate bowl, beat the cream cheese and sugar together until smooth and combined. Add the melted white chocolate and mix until combined. Gently fold in the whipped cream. Divide the cheesecake mixture evenly between two bowls. Add 1/4 cup (about 80g) of the cooled raspberry sauce to one bowl and combine. 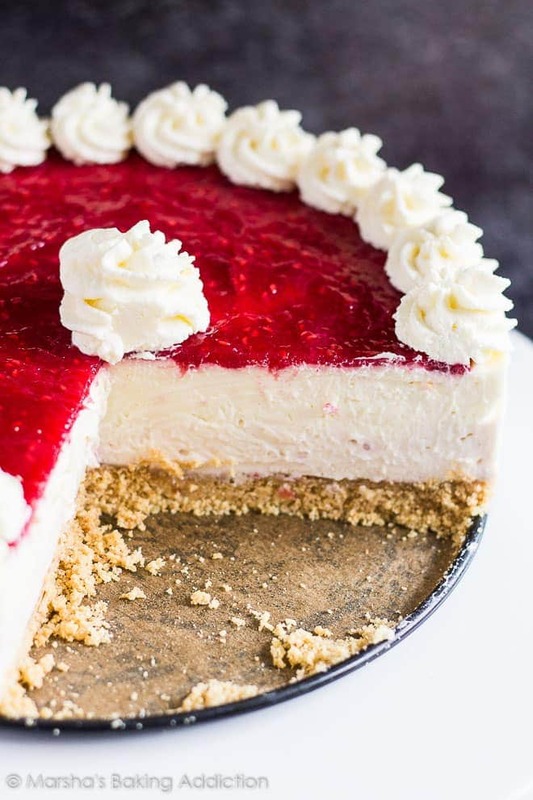 Spoon the raspberry cheesecake mixture over the chilled crust, and spread out evenly. Gently top with the white cheesecake mixture and smooth out evenly. Spread the remaining raspberry sauce on top and refrigerate for at least 6 hours, preferably overnight. How long will this no-bake cheesecake last? This cheesecake can be covered and stored in the fridge for up to 3 days. Can I freeze this cheesecake? Yep! This cheesecake can also be frozen, covered tightly, for up to 1 month. Thaw overnight in the fridge before serving. 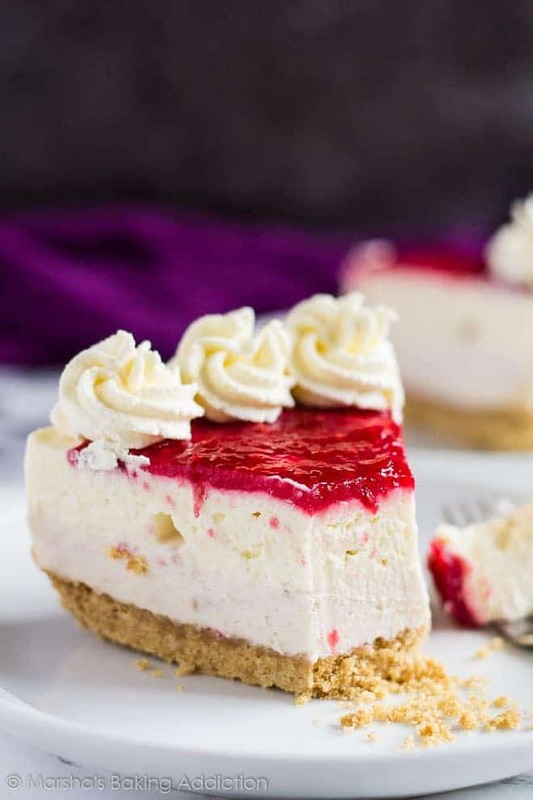 More delicious cheesecakes to try! 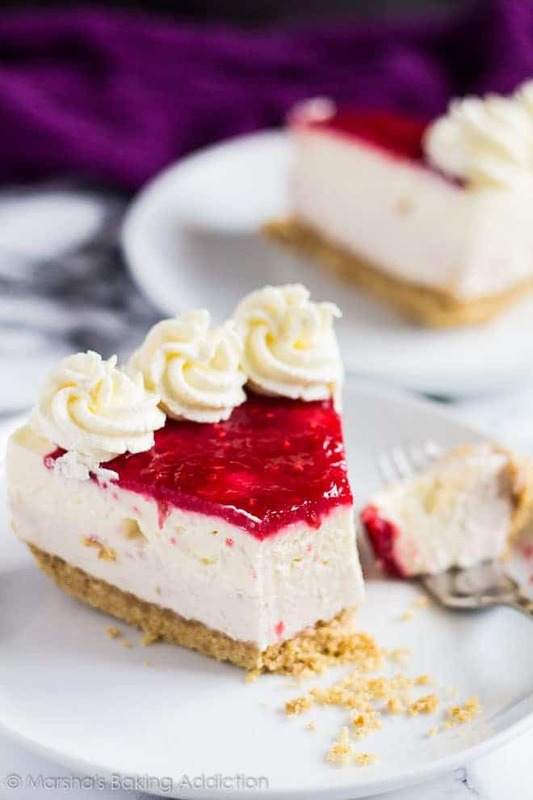 Scrumptiously creamy no-bake white chocolate cheesecake infused and topped with fresh raspberry sauce and whipped cream! In a saucepan over medium heat, combine the sugar and cornflour. Add the raspberry puree and stir constantly until the mixture thickens and comes to a boil. Allow to boil for 1 minute, then remove from the heat. Allow to cool completely. Press the mixture into the prepared pan and chill whilst preparing the cheesecake. Using a handheld or stand mixer, whip the heavy cream until it starts to thicken. Add the icing sugar and vanilla and whip until stiff peeks form. In a separate bowl, using the mixer again, beat the cream cheese and sugar together until smooth and combined. Add the melted chocolate and mix until combined. Gently fold in the whipped cream. Divide the cheesecake mixture evenly between two bowls. Add 1/4 cup (about 80g) of the raspberry sauce to one bowl and combine. Spread the raspberry cheesecake mixture evenly over the cooled crust. Gently top with the white cheesecake mixture and smooth out evenly. Spread the remaining raspberry sauce on top and chill for at least 6 hours, preferably overnight. Using a handheld or stand mixer, whip the heavy cream until it starts to thicken. Add the icing sugar and whip until stiff peeks form. Transfer the whipped cream to a piping bag and pipe swirls on top of the cheesecake. Slice and serve. Oh my goodness, this looks amazing! I love cheesecake!! Oh wow! My husband would LOVE this! Pinned for later! 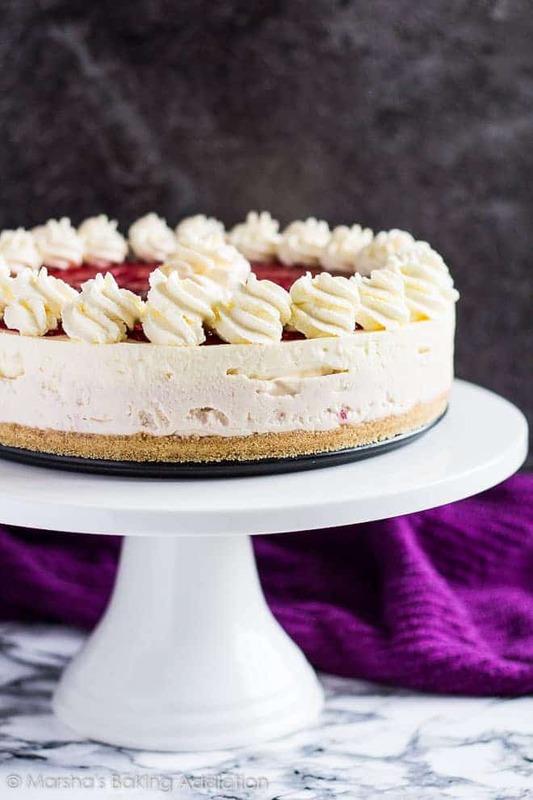 Looks sooo beautiful, Marsha <3 Cheesecake and white chocolate AND raspberries in one cake… Oh gosh /drolling! I call this a win, win, win, recipe! I’ll be adding to social media so I can come back and make this! There’s no dessert like cheesecake! White chocolate and raspberries are one of my favorite combos… well, white chocolate and everything, but white chocolate and raspberries is at the top! 😉 So this cheesecake is calling my name, girlfriend! This is absolutely GORGEOUS! And I love that it is no bake!! Gimme gimme! Cheers! Fantastic! Talk about Foodporn. No bake cheesecake is the best. A no bake cheesecake? Wow, this sounds like the perfect cheesecake for me! This is an absolutely beautiful cheesecake, Marsha! Really pretty. The combination of white chocolate and raspberry sounds divine! This looks delicous, Marsha. Can’t wait to try it, perfect for christmas day!!! !